Ten months on from the signature of a landmark agreement to reform emergency aid, critics worry that the process of translating 51 separate commitments into action is creating new layers of bureaucracy – the very thing the initiative was supposed to reduce. Some 48 of the biggest donors and aid agencies, controlling the majority, about $19 billion, of emergency aid spending a year (see chart), agreed to a package of reforms to humanitarian funding dubbed the “Grand Bargain” at the World Humanitarian Summit last May. The Grand Bargain’s key reforms include: giving more money directly to frontline responders; harmonising requirements for reporting to donors; reducing management costs; being more transparent; allowing for more multi-year funding and cash-based responses; and enhancing engagement between humanitarian and development actors. But fixing the way emergency aid is managed has spawned an unusual and cumbersome process involving 10 separate work streams and 20 co-convenors. Interviews with donors, UN agencies, and international NGOs point to plenty of optimism around commitments to improve ways of working, but also a fair amount of scepticism that the process will be able to deliver tangible change. The Grand Bargain’s champions however, say that after years of lip service, donors, UN agencies, and international NGOs are now talking seriously about changing how they work and, most crucially, they are having these conversations at the same table. “For the first time, people are taking very seriously the importance of efficiency in humanitarian response and the importance of local actors,” said Jemilah Mahmood, under-secretary general for partnerships at the International Federation of Red Cross and Red Crescent Societies, and former chief of the World Humanitarian Summit secretariat. In March, global NGO network ICVA published a briefing paper outlining progress on each work stream. It found that, one year on, most are still at the stage of mapping their topics and commissioning reports and surveys to understand the status quo and create baselines. The work stream on reducing management costs, for instance, has appointed a consultant to identify opportunities for joint procurement among UN agencies, some of whom are also holding discussions about ways to harmonise their due diligence procedures and auditing. A more concrete development is a soon-to-be launched pilot project involving several donors, the Norwegian Refugee Council, and the UN’s World Food Programme that aims to standardise reporting requirements. Other work streams are running into more difficulties. The localisation group, for example, is struggling to agree on who qualify as “local actors” and how to track the money that flows to them. Long-held concerns about the erosion of humanitarian principles remain an issue for the work stream dedicated to bridging the gap between humanitarian and development actors. The needs assessment work stream is also understood to be thorny, with participants struggling to reach consensus on how to coordinate the mapping of needs in a crisis in the most efficient way. Other interviewees told IRIN they were worried about the work streams on cash-based responses and reducing management costs, in particular that the hunt for efficiency could jeopardise programme effectiveness and undermine outcomes. In the case of cash, for example, some say that too much focus on distribution and not enough on monitoring could mean more efficient delivery in the short-term, but perhaps not to the right people. For many, the main concern is that the process itself is becoming overly cumbersome and bureaucratic. “There are just too many meetings,” one NGO official said. “It’s impossible to keep up with what’s going on.” Another complained about the “plethora of reports” coming out of the different work streams and questioned who was reading them. Each work stream has two co-convenors – one donor and one aid agency – responsible for arranging meetings and setting the agenda for discussion around their designated topic. Then there is the facilitation group, made up of a selection of signatories, which is responsible for collecting reports from the different work streams and planning the Grand Bargain annual meeting, due to take place in June. The Grand Bargain’s administration was initially steered by the WHS secretariat. When that disbanded last year, the European Commission's emergency aid department, ECHO, took up the baton, but it will soon pass it on to a small secretariat hosted by the Inter-Agency Standing Committee in Geneva. There is hope that the new secretariat will help improve communication and coordination between the different work streams, which some have said are following a “silo mentality” and “ignoring the bigger picture”. One senior financing advisor told IRIN: “You can’t address these issues in isolation. If you can’t agree on what a joint needs assessment is, for example, how are you going to be able to address planning and multi-year funding? Kate Halff, executive secretary of the Steering Committee for Humanitarian Response, an alliance of international NGOs that is part of the Grand Bargain facilitation group and a co-convenor of one of the work streams, warned of the risks of uneven and disjointed progress. “I do think that while certain actors are moving fast, there is a risk that moving very fast in a certain direction is potentially setting up a norm or a standard implicitly, rather than explicitly,” she said, referring to the possibility of some reforms being rushed through for the sake of progress, rather than on merit. The June meeting of all the Grand Bargain signatories in Geneva will be an opportunity for work stream convenors to report on progress and for some external stock-taking and analysis by Berlin-based consultancy GPPI consultants. 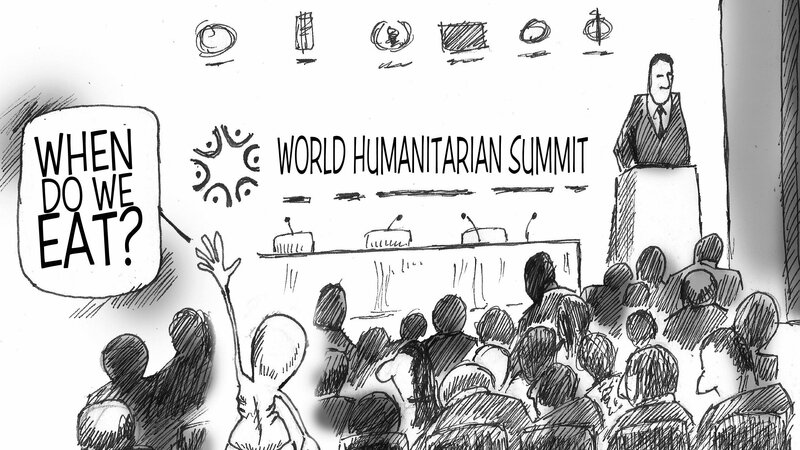 Did the World Humanitarian Summit spur real change or more meetings? Julia Steets, director of GPPI, acknowledged that the way the Grand Bargain had been set up was “hard to understand from the outside”. But she defended it, saying: “This way of doing things creates more organisational buy-in because everybody is responsible in some way. “With the individual work streams setting the tone for what they will do, you have a very distributed model of leadership. Until late last year, Kristalina Georgieva, who chaired the UN secretary-general’s High-Level Panel on Humanitarian Financing (which conceived of the Grand Bargain) was the face of the Grand Bargain. But Georgieva moved on almost five months ago to become a CEO of the World Bank. She is yet to be replaced and some say this is leaving a big gap. Melissa Pitotti, head of policy at ICVA, believes appointing a new leader – specifically, before the first annual meeting in June – is important. “It’s inevitable when you have these kinds of changes that you will run into roadblocks, because making change can be painful,” she explained. Even though progress on several targets appears to have been limited, some argue that the principles of the Grand Bargain are useful levers to galvanise change. “I know people are sceptical,” said Pitotti. “But from the perspective of the ICVA, we see some areas that could really help tackle issues that we are facing in the field. Several interviewees cited the harmonised reporting pilot as a big positive and hoped similar projects would follow. Late last year, several donors wrote to the UN to call for better responses to the humanitarian crises in Haiti and Nigeria. The letters, obtained by IRIN, cited aspects of the Grand Bargain to highlight where responders were falling short and called for more to be done to meet these standards. “It is becoming a yardstick by which people are trying to advocate to others for action, which is useful,” noted Julian Srodecki, director of innovative financing for humanitarian and emergency affairs at World Vision International. Maintaining the political momentum around the Grand Bargain and its reform agenda will be key. But the global political landscape has shifted significantly since its launch. The election of Donald Trump as US president and the lurch to the right in several European countries can only complicate implementation. Uncertainty about the future of aid budgets, particularly those that are dependant on US funding, has reduced the appetite for radical policy shifts of the sort needed if the aid system is to become more effective and efficient. On the flip side, however, should there be large cuts to aid budgets, the need for more efficiency in the aid system would become even more pressing, and the Grand Bargain’s role even more important. Either way, the sensitivities are apparent. A number of signatory donors we contacted to ask about progress towards commitments dodged our questions. What’s more, even if NGOs agree to reforms within the process, they will still have to convince governments at home to accommodate those changes. “We can all agree that we reduce the requirements in terms of reporting or we reduce earmarking and so on,” said Cecilia Roselli, institutional partnership advisor at the Norwegian Refugee Council. For some, the Grand Bargain’s greatest limitation is its failure to address the gap between needs and available resources – a failure that is increasingly evident as aid agencies struggle to respond to simultaneous crises around the world. Gareth Price-Jones, senior humanitarian policy and advocacy coordinator at CARE International, told IRIN: “The Grand Bargain is more about incremental improvements in efficiencies and donors demanding more for their money rather than about the fundamental issue that there are just not enough resources. There are also concerns that its focus on efficiency does little to challenge the over-arching power dynamics that, for example, limit funding flows to local organisations and reduce incentives for wider reform among large international NGOs and UN agencies. “The fact that aid is a business is something that’s not being said clearly enough, and there are a lot of elephants in the room,” noted one policy consultant. “[The Grand Bargain] does not address the architecture,” Pitotti acknowledged. “It does not address competition between actors, and it does not address the funding gap, which was the whole reason for the High-Level Panel in the first place. Pour ceux qui sont condamnés à les subir, les sécheresses ne sont pas des événements inhabituels. Il s’agit plutôt d’un mode de vie qui met constamment à l’épreuve leur résilience et leur ingéniosité.